The highly anticipated visual feast for the Chinese New Year, the 2019 Spring Festival Gala, began broadcasting live from the No. 1 Studio in China Media Group's headquarters on Fuxing Road in Beijing, from 20:00 (BJT) this evening. Kang Hui, Ren Luyu, Zhu Xun, Neghmet Raxman and Li Sisi are hosting the grand event. Besides the main stage in Beijing, this year the Gala also introduced three sub-venues: Jinggangshan in Jiangxi Province, a city famous for its "Red Culture"; Changchun in Jilin Province, the "Motor City"; and Shenzhen in Guangdong Province, one of the earliest cities to begin reform and opening-up. The three sub-venues sent their New Year's greetings respectively. Co-presented by the School of Dance of Shandong University of Arts, School of Music of Shandong Normal University, Nanning Art Theater Limited Liability Company, and Jilin City Song and Dance Troupe, the grand opening was a dancing performance to show the beauty of spring. Dragon and lion dances have always been traditional Chinese festival items. People perform the dragon dance to wish for good weather and grain harvest. "The dance of hundred lions and dragons," the second program of the Spring Festival Gala, not only sets the festive tone of the evening but also reflects people's good wishes for the New Year. The first crosstalk program of this year's Spring Festival Gala featured a traditional performance by Yue Yunpeng and his old partner Sun Yue. 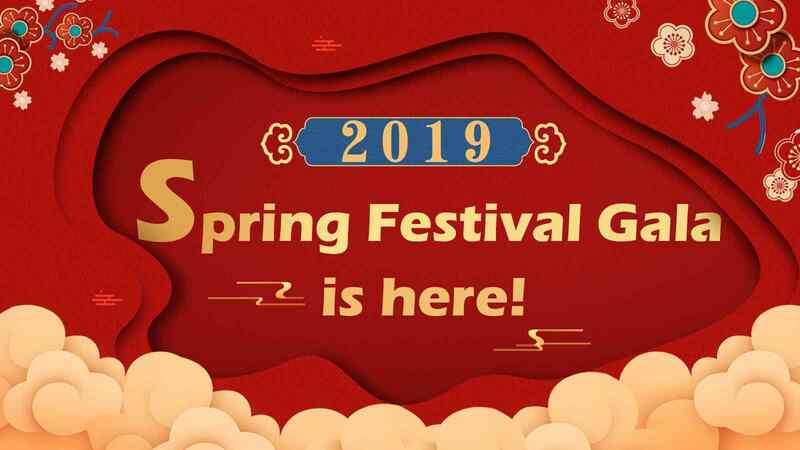 This is the third time that Yue has participated in the Spring Festival Gala. Opera lovers were thrilled by performances from Chinese opera masters and children groups on the main stage in Beijing. Chinese opera is an artistic treasure with great oriental charm, and the 2019 Spring Festival Gala invited opera artists including Yan Wei, Yuan Huiqin, Jin Buhuan, Tan Yuan and others to present different kinds of Chinese opera, including Jinhua Opera, Kun Opera and Cantonese Opera. After a wonderful musical performance, the audience enjoyed a creative performance by Chinese actors Li Yifeng and Zhu Yilong which featured dunk teams from Slovenia and Hungary. The host said that foreigners studying in China are fascinated by Chinese culture, and they are also regular visitors to the Gala. Compared to the singing and dancing performances, the international teams brought creative programs this year that fascinated the audience. Just classics and sports are not enough. Emerging young stars Karry Wang, Roy Wang, Jackson Yee, Jiang Shuying, Qin Lan and Jing Tian co-presented a song called "We are all dream chasers." The song expressed the vitality, courage and dreams of China's youth. Karry Wang, Roy Wang and Jackson Yee, also known as TFboys, are emerging idols for millions of fans for their talent and diligence, although their average age is barely 20 years old. Famous film actor Ge You made his debut on the Spring Festival Gala. Playing a leading role in a sketch comedy with household comedians Cai Ming, Pan Changjiang and Qiao Shan, and young actors Zhai Tianlin and Guo Xiaoxiao, his performance drew a heavy applause from the audience. Liu Qian, a magician from China's Taiwan, also joined in 2019 Spring Festival Gala after impressive performances in previous years. His performance this year focused on audience interaction. He invited different audience members to the stage and performed a suspenseful and wonderful show involving drink-related magic, which added to the festive atmosphere. Mahua FunAge, a team mainly focused on stage plays, musical performances and sketch comedies, also brought their core members, including Ma Li, Shen Teng, Chang Yuan and others to bring the audience an education-themed performance. Although some familiar faces will be absent this year, young viewers highly anticipate some new faces, including Deng Lun, who teamed up with William Chan and Jackie Chan for a song about the fiery passion of the new era. In the Shenzhen sub-venue, pop singers Wakin Chau from Hong Kong Special Administrative Region and Richie Jen Hsien-chi from China's Taiwan performed a music show. Accompanying the duo was well-known Chinese pianist Lang Lang and many other young pianists. The song presented was "Friends," a single by Wakin Chau released in 1997. The song was so popular at that time and still has profound impact now in the music world. The version of "Friends" staged tonight was interspersed with a Chinese folk song, giving it a special feeling. Actress and model Lin Chi-ling from China's Taiwan jointly presented a creative show with Wuhan Han Show Art Troupe, synchronized swimming teams of the Hubei and Hunan Provincial Bureau of General Administration of Sport of China and the Liaoning Ballet of China. The show combined a ballet performance in the water with one on land. The elegant moves of the dancers and swimmers, the big water curtain and the patterns made up by their bodies, all gave a stirring effect and great artistic enjoyment to the audience.